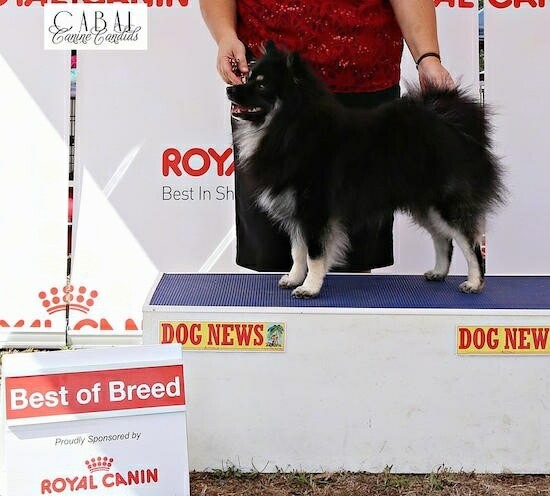 Sneakers the show quality German Spitz Medium– Australian Champion Sabarka Been Sneaky In Luv – Sneakers (Best in Specialty Show winner 2013, Best of Breed Canberra Royal 2014, Best of Breed Sydney Royal 2014 plus many other awards too numerous to mention). 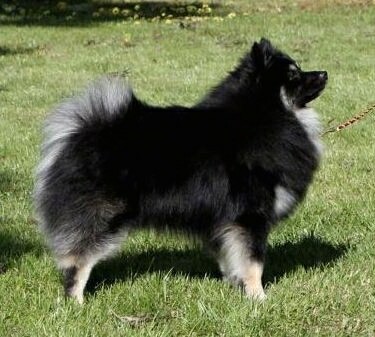 The Standard German Spitz comes in a wider variety of coat colors than some of its Spitz cousins, including black, brown, orange, wolf gray and white. The compact, triangular ears are close together and high set. The hair on the head is short compared to the rest of the body, but it is still very thick. The feet are very small with hair in between the toes. The eyes appear to be proportionally large. The tail is curled on top of the back and lies against the side of the body. Happy, alert, watchful and buoyant, German Spitzes make good watchdogs. They are excellent jumpers and love to stand on their hind legs. They enjoy a lot of human attention, and are very happy to please. Teach this dog early that it may bark a couple of times when the doorbell rings or when there are visitors, but then to keep quiet. Be very consistent about this. They are alert, curious and very busy. 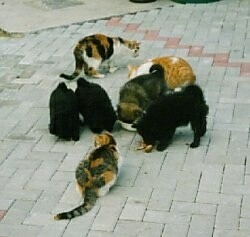 They must be taught that the owner is the boss, or they will not listen. This breed may become too demanding if the owner allows it. If you do not show this dog all humans are pack leader to him, he will not be trustworthy with children. They may become nervous and snappish toward them. However, they can get along well with children so long as the child is taught how to demonstrate leadership skills. It is a good companion for an elderly person. Without a stern, confident, consistent pack leader, they will be feisty, willful, bold, temperamental, and will not be easy to obedience train. When trained properly they make good companions. Along with being a strong pack leader, socialize well to avoid them from becoming reserved and barking at strangers, other dogs and animals, which may lead to dog aggressiveness. They are very beautiful and elegant in the show ring. The best way to reinforce your pack leader status is to take them for daily pack walks. This not only helps the dog see you as the leader, but it releases mental and physical energy, making the dog stable minded, levelheaded and confident that he knows his place in the world. This breed needs to be taken on a daily walk or jog. They will happily company their owners on a 20-mile walk or one mile daily walk. 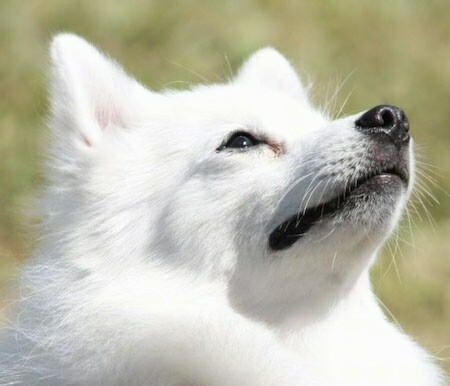 Polly (Llancarfan Polar Romance) a pure white German Spitz with imported parentage from Germany) is a show quality German Spitz Medium. Australian Champion Sabarka Been Sneaky in Luv, aka Sneakers as a puppy at 3 months old. 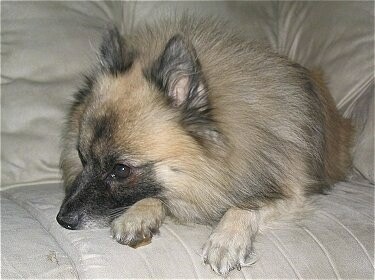 He is a show quality German Spitz Medium. 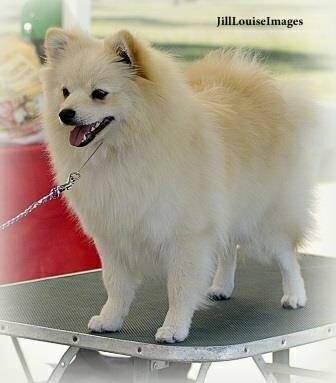 Australian Champion Sabarka Dainty by Design, aka Daisy is a cream German Spitz winning Reserve Challenge Female Sydney Royal 2014, a very nice show quality German Spitz Medium. 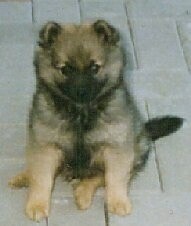 Sabarka Echoes in the Mist, aka Echo as a puppy at 8 weeks old. 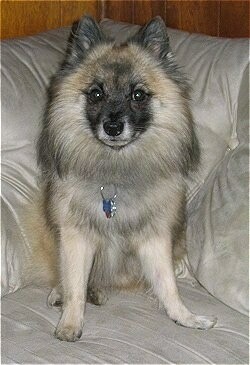 A nice show quality German Spitz Medium. 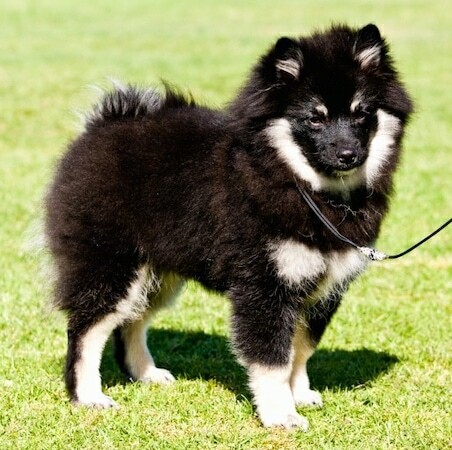 Show quality litter of German Spitz Medium puppies from Sabarka's litter. 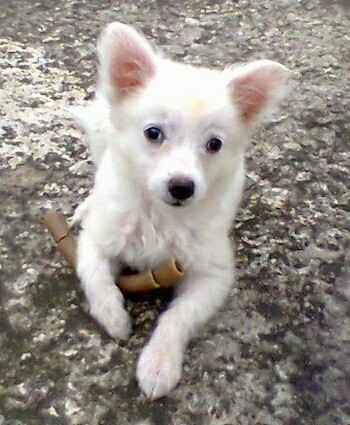 Show quality white German Spitz Medium puppy from Sabarka's litter with her toy. 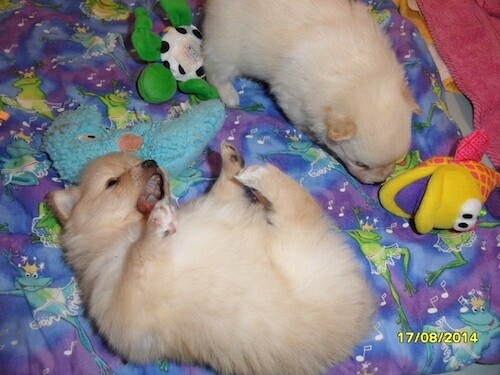 These German Spitz puppies are being well socialized with cats. 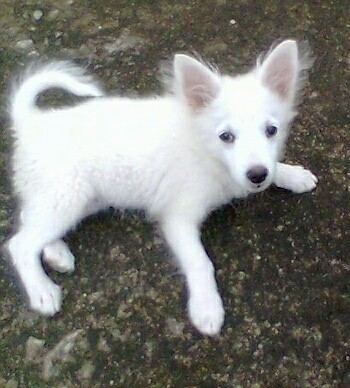 "This is Jimmy, a medium German Spitz at 6 months old. 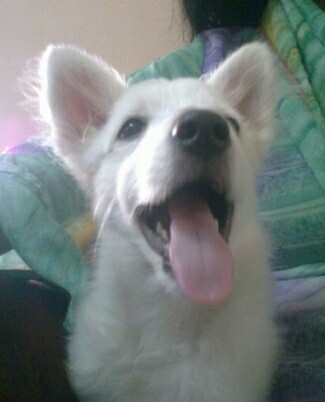 She is very, very sweet and active. 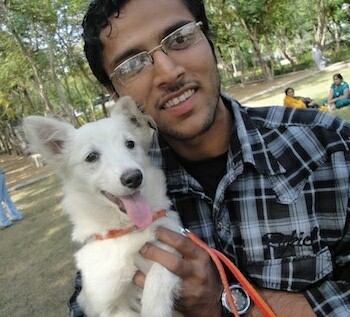 She goes for a 2-km walk daily and was potty trained right away as a small puppy."